That time we slept in negative 22 degrees (Celsius) under the brilliant starry sky. If you haven’t already read about our first day of the salt flat tour and how we got two jeeps stuck in the mud, then check it out here. Here you can see Uyuni, the starting point of most tours, and the Salt Flats – the big white area from the satellite. Day 2 was an early start as we had plenty of ground to cover. Today was the day of the flamingos. The salt flats are so large (check out the map) that these tours inevitably involve a lot of driving, so we were very grateful that we got on well with the rest of the group. Top tip: rather than having set seats, ask your group whether you can move around so that you get some time riding up front and don’t have to spend all day cramped in the back! We saw lagos of all sizes and colours with a lot of different wildlife to admire. Our first lake was very high up and very cold, corroborated by the ice that formed on the surface of the lake. There was no doubt of its beauty and we all appreciated the chance to admire, but before long we were back in the vehicle because none of us were all that prepared for the cold weather. We had alpaca wool produce that we had picked up in Cusco and La Paz but in spite of them, we were losing feeling in our limbs. A long stretch of driving took us past a field full of llamas and alpacas, so Luis (our guide/driver) let us out to have a wander. We got a little carried away here, to say the least. Llamas are generally quite tranquil animals, but if you get close and the llama doesn’t like it, it will most likely spit in your face. This actually didn’t happen to Martin or me, but we enjoyed when it happened to others. We sneaked up on llamas, Martin and I trying to get closer to a llama than the other could (everything is a competition), but most of them ran away before we got that close, with one exception. There were many inset puddles that were lower than ground level but sufficiently wide and looked incredibly cold if we were to misstep, and they were everywhere so we really needed to be careful. So obviously we competed over who could jump the largest trench. There was one of these puddles between us and this particular alpaca, and I suspect that is why it didn’t get spooked. Our destination before we stopped for llamas and alpacas was what is imaginatively named the Blue Lagoon or Laguna Azul. It is situated perfectly in front of a dormant volcano and completely covered with flamingos, making for postcard views. We were dropped off on one side and were able to walk the length of the lake, checking out the different angles before hopping back into the jeep. We were given an hour to explore Vallee des Roches, which is another giant playground for adults, made from rocks. It had small structures to run up as well as giant towers that took some route planing before we climbed up! We chose the dodgiest-looking ones to climb, simultaneously racing each other to the top with terrible trash talk, so embarrassingly uninsulting that I won’t repeat it here. From the top we admired the view of the protruding natural structures in front of the totally flat landscape in all directions surrounding us, so flat that it looked like a two-dimensional photograph rather than real life. From here we waved at our incredulous friends down below. Even if you wouldn’t enjoy climbing up unstable and precariously-balanced rocks, the circuit around this children’s playground gave fantastic views of the surrounding areas. We had two more stops before we reached our accommodation: 1) Laguna Colorada and 2) Geysers Sol. Laguna Colorada is a red lake, which is so counter intuitive to what Martin and I had previously thought a lake should look that our brains took a moment to recognise that it was actually red in colour. There are a few of these dotted all over the planet and they generally get their red colour from the algae living in the lake at very high altitude, in this case, at 4295m asl. It was so windy and so cold, that once we had all had a go at being flamingos, we ran back to the car out of desperation for some protection from the brutal wind, lips and fingertips already turning a little blue. Luis, sat in the comfort of the jeep, found our blue lips and limbs very entertaining, so that was reassuring. The geysers were equally stinky as they were impressive. The steam erupted so quickly and violently from each hole that we could not escape the smell as the sulphur-bad-egg like odour completely encompassed us, no matter in which direction we ran. We expected the air to be hot but it didn’t scald our faces, which was both surprising and a relief. Darkness crawled in very quickly, as ever, and when this happens the harsh cold temperature of the day doesn’t have a patch on the brutal night-time temperatures, so that was our cue to get back in the jeep to get to our lodgings for the night. Our evening accommodation was next to a natural hot spring and away from any light pollution, being in the middle of the desert. For this reason, there was also no heating, so we sat together exchanging stories in our big down jackets, watching our collective breath as we laughed away. After dinner (included in the price of the tour), the outside temperature had already dropped to negative 8 degrees Celsius when we announced to the rest of our group that we were heading to the hot spring. They initially thought we were joking and then scoffed at the invitation to come with us. One of the lagoons we saw that day. The springs cost 5 soles each (about 50p), and we had the entire place to ourselves. There wasn’t a cloud in the sky to block our view of the beautiful starry night. The darkness was borderless with the blue-purple abyss stretching on to infinity, covered in tiny freckles of sparkles. We loved it. We had almost an hour to ourselves before the springs got really busy, as other tours had finished their dinner and headed down to pool. Making plenty of friends was easy because we all shared the same awestricken expression as we continued to admire the mesmerising sky. We stayed chatting until our hair was frozen and our fingers were saturated and looking like prunes. Getting out sucked. The temperature had now dropped to -15 degrees Celsius and the hot springs, where we had been comfortable sitting for over two hours, were nice and toasty. We felt like our limbs would fall off from the cold. Getting back inside the accommodation didn’t bring us much comfort either with its lack of heating. A great group of three days! We decided that alcohol would warm us up, so we played drinking games with Camille and the three crazy Brazilians in our group, who hadn’t left the accommodation complex but still required a drinking jacket. A great way to make friends, solidify friends and lose friends is to play a game called ‘Entwine’. The premise is simple; you must play the same number as the person before you. If you don’t have a card that satisfies this rule in your hand, you must drink, and the person the other side of you continues play by putting down any card they like. The only difference is, the direction of play has reversed, so it’s your turn next and your neighbour knows at least one card you do not have. There is an additional rule that if four of a kind go down without a break then the next person has to down their drink, but we had precious supply of alcohol so we decided not to adopt this rule (this time). Jokers make the game a lot more fun. This ended up with six very drunk people, five of who could still feel the savage cold that had now become -20 degrees Celsius. One of the group, however, had been so unfortunate with Entwine that she locked herself in the toilet for over an hour. The toilets were outside. This, obviously, worried the rest of us a great deal, and when we eventually convinced her to unlock the door, we dressed her in all of her clothes and put her to bed, shortly following suit ourselves. Temperatures dropped to negative 22 degrees Celsius so we had little sleep that night, despite desperately clinging to each other for some semblance of body heat. This is by far the coldest I have every been. Info: The three day tour really consists of two days of activities and the final day is driving back to Uyuni or to the Bolivia-Chile border and then on to San Pedro. We decided to head into Chile to stay a couple of nights in the Atacama desert. It helped that we crossed the border with our Brazilian friends as a group, because they are more likely to pick on tourists from further afield, for example, two Danes behind us got royally screwed over and had to pay a hefty fine simply because the border control police felt like it. There was nothing our Danish friends could do other than pay, as the transport had dropped them at the border and left. Tip of the week: wrap up warm. The night got as chilly as -22 degrees Celsius and even with Martin and me in a bed like sardines, we couldn’t sleep because of the cold. Last week’s tip was to haggle in the sleeping bag with the cost of the trip, but you need more than that to keep warm. Good luck. 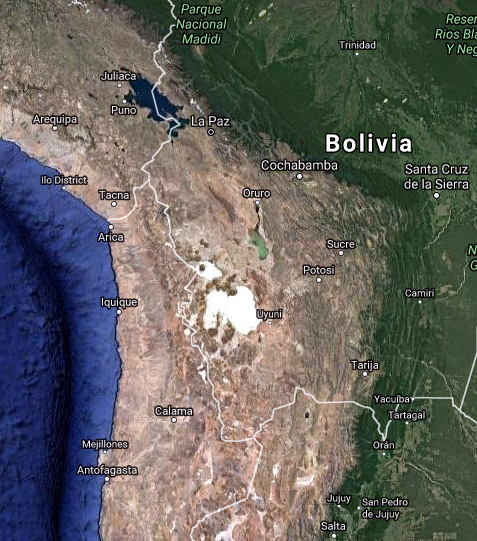 Product of the week: Make sure you try Bolivian wine, a necessity to help with the temperature situation. The main (only) region is Tarija, so make sure you look for this on the bottle.